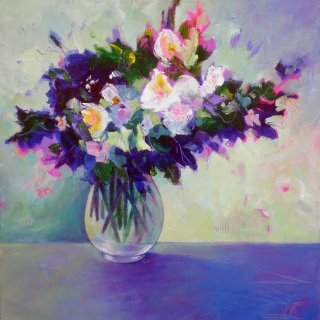 A few weeks ago I decided to work on some color studies and chose florals as the basis for this study. 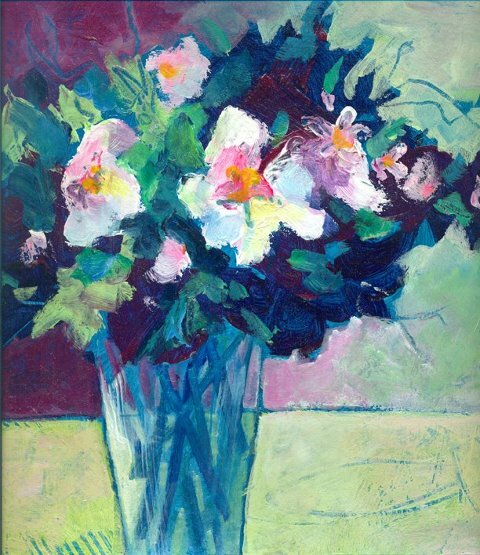 Florals are something I haven't painted in years, I had the idea that they were a bit old fashioned, but I decided that they were ideal for my intention of doing paintings in a variety of different colors, and in color combinations that I would never usually choose. I also wanted to use more paint in my work. I often find that I am very mean with the amount of paint I use, trying to cover large areas of the canvas with a miserable amount of paint on my palette. I think this comes from the fact that much of my previous work was created by layering many thin layers of paint to build up a rich depth of color. The idea with these studies was also to work very loosely with no attempt to create real flowers but just to give the impression of flowers. I call them my "Posies" an old fashioned name for flower bouquets. I really enjoyed this exercise and feel I learned a lot. You can see the whole range on my Fine Art America site. What do you think? Are florals old fashioned?